In signing the Paris Climate Agreement, the Australian government committed to a global goal of zero net emissions by 2050. Australia’s promised reductions to 2030, on a per person and emissions intensity basis, exceed even the targets set by the United States, Japan, Canada, South Korea and the European Union. But are we on the right track to achieve our 2030 target of 26-28% below 2005 levels? With one of the highest population growth rates in the developed world, this represents at least a 50% reduction in emissions per person over the next dozen years. Consider the impact of one sector, the built environment. The construction, operation and maintenance of buildings accounts for almost a quarter of greenhouse gas emissions in Australia. As Australia’s population grows, to an estimated 31 million in 2030, even more buildings will be needed. In 2017, around 18,000 dwelling units were approved for construction every month. Melbourne is predicted to need another 720,000 homes by 2031; Sydney, 664,000 new homes within 20 years. Australia will have 10 million residential units by 2020, compared to 6 million in 1990. Ordinary citizens might be too preoccupied with home ownership at any cost to worry about the level of emissions from the built environment and urban development. What’s being done to reduce these emissions? The National Construction Code of Australia sets minimal obligatory requirements for energy efficiency. Software developed by the National Housing Rating Scheme (NatHERS) assesses compliance. Beyond mandatory minimum requirements in Australia are more aspirational voluntary measures. Two major measures are the National Australian Built Environment Rating System (NABERS) and Green Star. This combination of obligatory and voluntary performance rating measures makes up the practical totality of our strategy for reducing built environment emissions. Still in its experimentation stage, it is far from adequate. An effective strategy to cut emissions must encompass the whole lifecycle of planning, designing, constructing, operating and even decommissioning and disposal of buildings. A holistic vision of sustainable building calls for building strategies that are less resource-intensive and pollution-producing. The sustainability of the urban landscape is more than the sum of the sustainability of its component buildings; transport, amenities, social fabric and culture, among other factors, have to be taken into account. Australia’s emission reduction strategy fails to incorporate the whole range of sustainability factors that impact emissions from the built environment. There are also much-reported criticisms of existing mandatory and voluntary measures. A large volume of research details the failure of voluntary measures to accurately evaluate energy performance and the granting of misleading ratings based on tokenistic gestures. On top of that, the strategy of using front runners to push boundaries and win over the majority has been proven ineffective, at best. We see compelling evidence in the low level of voluntary measures permeating the Australian building industry. Some major voluntary rating tools have penetration rates of less than 0.5% across the Australian building industry. As for obligatory tools, NatHERS-endorsed buildings have been shown to underperform against traditional “non-green” houses. That said, voluntary and obligatory tools are not so much a weak link in our emission reduction strategy as the only link. And therein lies the fundamental problem. So what do the experts suggest? most importantly, end users just do not care – nobody has bothered to communicate the Paris Accord promise to Joe and Mary Citizen, let alone explain why it matters to them. Tweaking the rating tools further would be a good thing. Getting more than a token few buildings rated would be better. But the show-and-tell display of a pageant of beautiful, green-rated headquarters buildings from our socially responsible corporations is not going to save us. Beyond the CBD islands of our major cities lies a sea of suburban sprawl that continues to chew up ever more energy and resources. It costs between 8% and 30% more than the usual costs of a building to reduce emissions. Someone needs to explain to the struggling home owner why the Paris climate promise is worth it. Given the next election won’t be for a few months, our political parties still have time to formulate their pitch on who exactly is expected to pay. Garden roofs (like these in Chengdu, in China’s Sichuan province) need maintenance and community involvement. As Australian cities grow and transform, we need to ensure we are not building the slums of the future by making buildings so tall and tight they turn our streets into stark canyons. Sydney’s Wolli Creek, where buildings dominate and tower over a transport hub, is an example of where this is happening. It is now considered one of the city’s densest areas. Dense, high buildings limit the space available for urban greenery and, unfortunately, the current development boom privileges concrete and glass over vegetation. A more strategic approach to urban growth can ensure our cities maintain adequate green space and become low-carbon, efficient and affordable. It’s also vital the community and individuals are enthusiastic drivers of such change, with shared ownership of it. Imaginative projects – at times described as urban acupuncture – can all play a role. This is where small-scale interventions (like green balconies) are applied to transform the larger urban context, improve the environment and make the city liveable. Whether you go up (higher) or out (more), or both, there are always challenges and opportunities. The drawback in going out is that we start creeping into our remaining open space, including important biodiversity hotspots. Sydney’s Wolli Creek is considered one of the city’s densest areas. Going out can also encroach on agricultural land. Farmers around the Sydney basin produced up to 20% of the area’s fresh food needs in 2011. But researchers have predicted urban sprawl and rising land prices will lead this to drop to 6% by 2031, losing both produce and jobs. Going up is an approach driven by proximity to transport, utilities and employment, particularly in Sydney and Melbourne. Major upward developments, like Wolli Creek, are logically being located around transport nodes. But these then become dense and concentrated areas, putting growing pressure on open space and community facilities. Community consultation is key before any major project and redevelopment, as genuine dialogue supports shared ownership of the outcomes. Existing community projects must be celebrated. Having an engaged and empowered community leads to a healthier, happier population. In Sydney, new precincts like Waterloo are ambitious and have good intentions. These areas aim to deliver new homes, shops, major transport services, community facilities, parks and open spaces over the next 20 years – and they’re located close to the urban centre. Waterloo already has three community gardens, which bring together public housing residents through growing and sharing fresh produce. This approach is important to continue and initiate new projects. Green roofs can become community gardens. Around the world there have also been successes with city farming where the community grows and sells agricultural produce locally. In skyscraper Singapore, they are farming vertically at Sky Greens, providing an alternative to importing food for this densely peopled city-state. Green roofs are another alternative where communities can grow flowers and vegetables while providing training and jobs. A good example is the Uncommon Ground rooftop farm in Chicago. In Australia, the Grounds is a former pie factory in the industrial heart of Sydney’s Alexandria. In 2012, the site began to metamorphose into a cafe, restaurant, bakery, organic mini-farm and more. This is a successful example of how a little greenery has turned a bleak post-industrial site into an enjoyable destination, where young and old from far and wide come to enjoy the plants, animals and coffee. The Grounds in Sydney’s Alexandria was transformed from an industrial site into an enjoyable destination. A domestic garden, a green balcony or a green wall can all play a role – but these need ongoing care and attention, which means individuals and engaged communities must drive the enthusiasm. So, for a start, let’s not build fast and furiously without grasping the place as a whole and making the most of what is already there. This means preserving mature trees and shrubs, leaving open space unpaved and protecting areas of deep soil for future planting. Maintaining, enhancing and creating urban green space not only fulfils the requirements for urban acupuncture, but – to mix medical metaphors – provides a kind of urban vaccination against the emergence of slums, where nothing can grow and depression sets in. We can combine building development with what Stefan Boeri Architects have described as “vertical densification of nature within the city” to achieve a new kind of urban nature – nature in the city to transform the nature of the city. Covering roofs and walls of buildings with vegetation is a good way of reducing greenhouse gas emissions. And these green roofs and walls make cities look nicer. Toronto’s central business district adopted a policy of establishing green roofs on around half of all city buildings in 2009. Research shows this could reduce maximum city temperatures by up to 5℃. We spent the past 12 months analysing the case for more greenery on Australian city buildings, drawing on international comparisons. We’ve shown that a mandatory policy, coupled with incentives to encourage new and retrofitted green roofs and walls, will provide environmental, social and business benefits. These include improved air quality, energy conservation and reductions in stormwater run-off from buildings, which would decrease flash flooding. Green roofs and walls also become new habitats for biodiversity and can be pleasant spaces for social interaction in dense urban areas. We found numerous studies confirming that greenery on inner-city buildings reduces the urban heat island effect, which is when city centres are hotter than surrounding suburban and outer-urban areas. Green roofs are great social spaces. We examined international case studies of cities embracing green roofs and walls to review policy frameworks which could be suitable for Australia. A range of measures and policies exist and vary depending on building types (buildings need specific features to host vegetation) and the degree to which policies can be enforced. Singapore is leading in this area. It markets itself as a “garden city” to attract investment, visitors and commerce. Green roofs and walls are a vital and visual manifestation of this policy. Green walls are aesthetically pleasing. Greenery is ingrained in Singapore’s development sector and is boosted by incentives, grants, awards, certification schemes and government-led development. Through this voluntary-heavy (yet supported) effort, Singapore increased its number of green roofs and spaces nine-fold between 2006 and 2016. Rotterdam’s efforts weren’t as extensive as Singapore’s, but the city more than doubled its green roof area from 2012-2017 through incentives, grants, tax benefits and demonstration projects. London increased its total green-roof area more than four-fold from 2005-2016. This was partially achieved through a biodiversity action plan. And Toronto has the second-largest area of green roofs of the four cities we studied. This has been delivered through a mandatory policy, introduced in 2009, that requires all new developments with roofs of 2,000m² or more to install green roofs. We modelled what could be delivered in the City of Sydney and the City of Melbourne based on the measures taken in Singapore (which is voluntary-heavy), London (voluntary-light), Rotterdam (voluntary-medium) and Toronto (mandatory). We combined this with data on actual green building projects in 2017 in Sydney and Melbourne to show the potential increase of projects in each city based on the four policies. In the Sydney local government area, 123 green roof and wall projects were under way in 2016. The below table uses this base to estimate what the numbers of such projects would be for three time periods, based on the policies in the four scenarios modelled. In the Melbourne local government area, 28 green roof and wall projects were under way in 2016. The table below shows how these could increase based on policies of the four case studies modelled. Sydney and Melbourne have green roof and green wall policies aligned with their 2030 and 2040 sustainability targets, launched in 2012 and 2015 respectively. Sydney has the Green Roofs and Walls Policy Implementation Plan, while Melbourne has the Growing Green Guide 2014. These policies appear most aligned with the voluntary-light approach adopted in London. Sydney had a 23% increase in green roofs since its policy launch, although this was from a very low starting point. Melbourne also reports an increase in green roofs and walls, though the amount of uptake isn’t publicly available. There are, of course, barriers to greening up buildings. These include costs as well as lack of experience in the industry, especially in terms of construction and management. Professional capacity for green roofs is still in a developing phase and further training and skill development are needed. Green wall adds vegetation to an aged care home in Sydney. Around 87% of the building stock Australia will have in 2050 is already here, and a large proportion of existing buildings could be retrofitted. We recommend a voluntary approach using a mix of initiatives for building owners, such as tax benefits and credits in green building tools. If planners understand it’s cool to green cities, what’s stopping them? Focusing on new buildings is likely to lead to more modest growth rates in the short to medium term, relative to alternative approaches such as retrofitting. The annual growth rate of new stock is around 1-3%, which means that policies focusing on new stock will have a substantial impact over the long term. However, in the short to medium term, a retrofit policy would have greater impact given the numbers of existing buildings suitable for this. Local government areas can also promote the evidence showing the lift in property values in areas with more green infrastructure – in some instances up to 15%. This should encourage voluntary uptake. Fungal bricks have the potential to create safer and more sustainable buildings. Would you live in a house made of fungus? It’s not just a rhetorical question: fungi are the key to a new low-carbon, fire-resistant and termite-deterring building material. This type of material, known as a mycelium composite, uses the Trametes versicolor fungus to combine agricultural and industrial waste to create lightweight but strong bricks. It’s cheaper than synthetic plastics or engineered wood, and reduces the amount of waste that goes to landfill. Fungal brick prototypes made from rice hulls and glass fines waste. Working with our colleagues, we used fungus to bind rice hulls (the thin covering that protects rice grains) and glass fines (discarded, small or contaminated glass). We then baked the mixture to produce a new, natural building material. Making these fungal bricks is a low-energy and zero-carbon process. Their structure means they can be moulded into many shapes. They are therefore suited to a variety of uses, particularly in the packaging and construction industries. A staple crop for more than half the world’s population, rice has an annual global consumption of more than 480 million metric tonnes and 20% of this is comprised of rice hulls. In Australia alone, we generate about 600,000 tonnes of glass waste a year. Usually these rice hulls and glass fines are incinerated or sent to landfill. So our new material offers a cost-effective way to reduce waste. Fungal bricks make ideal fire-resistant insulation or panelling. The material is more thermally stable than synthetic construction materials such as polystyrene and particleboard, which are derived from petroleum or natural gas. Rice hulls, glass fines and the mixture of rice, glass and fungus, before baking. This means that fungal bricks burn more slowly and with less heat, and release less smoke and carbon dioxide than their synthetic counterparts. Their widespread use in construction would therefore improve fire safety. Thousands of fires occur every year and the main causes of fatalities are smoke inhalation and carbon monoxide poisoning. By reducing smoke release, fungal bricks could allow more time for escape or rescue in the event of a fire, thus potentially saving lives. Termites are a big issue: more than half of Australia is highly susceptible to termite infestations. These cost homeowners more than A$1.5 billion a year. Our construction material could provide a solution for combating infestations, as the silica content of rice and glass would make buildings less appetising to termites. The use of these fire-and-termite-resistant materials could simultaneously revolutionise the building industry and improve waste recycling. Figure 3. Termite infestation zones in Australia. This is an exciting time to get creative about our waste. With China no longer buying Australia’s recycling – and new rules reducing plastic use in Australian supermarkets – we have the chance to move in line with communities in Japan, Sweden and Scotland that have near-zero waste. Fungal bricks could be just one example of the creative thinking that will help us get there. With some tweaks to the recipe, cement and concrete can be made kinder to the planet. Cement is the world’s most widely used material apart from water, largely because it is the key ingredient in concrete, the world’s favourite building material. But with cement’s success comes a huge amount of greenhouse emissions. For every tonne of cement produced in Australia, 0.82 tonnes of CO₂ is released. That might not sound like much, especially when compared with the 1.8 tonnes emitted in making a tonne of steel. But with a global production of more than 4 billion tonnes a year, cement accounts for 5% of the world’s industrial and energy greenhouse emissions. Read more: The problem with reinforced concrete. The electricity and heat demands of cement production are responsible for around 50% the CO₂ emissions. But the other 50% comes from the process of “calcination” – a crucial step in cement manufacture in which limestone (calcium carbonate) is heated to transform it into quicklime (calcium oxide), giving off CO₂ in the process. A report published by Beyond Zero Emissions (BZE) (on which I was a consultant) outlines several ways in which the sector can improve this situation, and perhaps even one day create a zero-carbon cement industry. The cement industry has already begun to reduce its footprint by improving equipment and reducing energy use. But energy efficiency can only get us so far because the chemical process itself emits so much CO₂. Not many cement firms are prepared to cut their production to reduce emissions, so they will have to embrace less carbon-intensive recipes instead. The BZE report calculates that 50% of the conventional concrete used in construction can be replaced with another kind, called geopolymer concrete. This contains cement made from other products rather than limestone, such as fly ash, slag or clay. Making this transition would be relatively easy in Australia, which has more than 400 million tonnes of fly ash readily available as stockpiled waste from the coal industry, which represents already about 20 years of stocks. 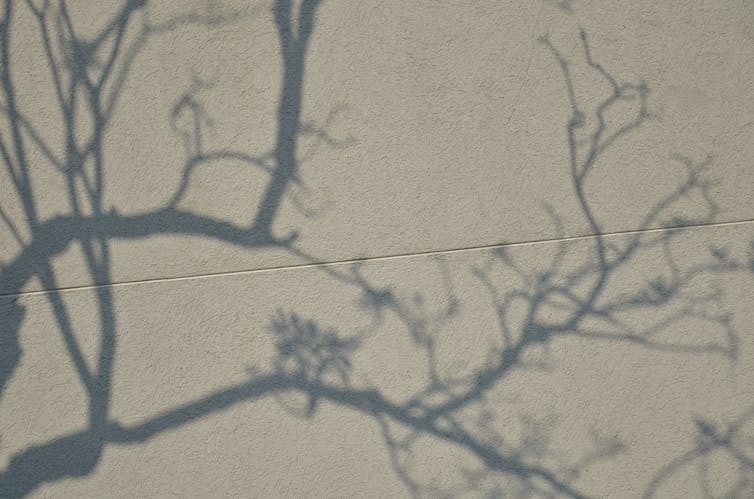 Read more: Eco-cement, the cheapest carbon sequestration on the planet. These types of concrete are readily available in Australia, although they are not widely used because they have not been included in supply chains, and large construction firms have not yet put their faith in them. Another option more widely known by construction firm is to use the so-called “high blend” cements containing a mixture of slag, fly ash and other compounds blended with cement. 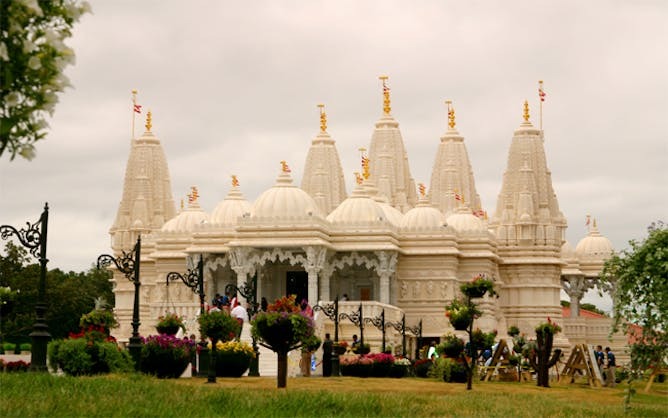 These blends have been used in concrete structures all over the world, such as the BAPS Shri Swaminarayan Mandir Hindu temple in Chicago, the foundation slab of which contains 65% fly ash cement. These blends are available everywhere in Australia but their usage is not as high as it should due to the lack of trust from the industry. Built on the fly (ash): a Hindu temple in Chicago. It is even theoretically possible to create “carbon-negative cement”, made with magnesium oxide in place of traditional quicklime. This compound can absorb CO₂ from the air when water is added to the cement powder, and its developer Novacem, a spinoff from Imperial College London, claimed a tonne of its cement had a “negative footprint” of 0.6 tonnes of CO₂. But almost a decade later, carbon-negative cement has not caught on. The CO₂ released during cement fabrication could also potentially be recaptured in a process called mineral carbonation, which works on a similar principle as the carbon capture and storage often discussed in relation to coal-fired electricity generation. This technique can theoretically prevent 90% of cement kiln emissions from escaping to the atmosphere. The necessary rocks (olivine or serpentine) are found in Australia, especially in the New England area of New South Wales, and the technique has been demonstrated in the laboratory, but has not yet been put in place at commercial scale, although several companies around the world are currently working on it. Read more: The ‘clean coal’ row shouldn’t distract us from using carbon capture for other industries. Yet another approach would be to adapt the design of our buildings, bridges and other structures so they use less concrete. Besides using the high-performance concretes, we could also replace some of the concrete with other, less emissions-intensive materials such as timber. Previously, high greenhouse emissions were locked into the cement industry because of the way it is made. But the industry now has a range of tools in hand to start reducing its greenhouse footprint. With the world having agreed in Paris to try and limit global warming to no more than 2℃, every sector of industry needs to do its part.